Why your GPS track is different than VOR radial you looked up on a chart? Magnetic variation in FSX is outdated – what problems it causes and how to fix it? I did a simple experiment. STAR chart for Gdańsk (EPGD) shows how GRUDA1P arrival procedure shoold look like. GRUDA1P is no longer available – in case you wish to fly to Gdańsk – check the current procedures. I wrote this text some time ago. Aircraft arriving in Gdańsk should intercept outbound radial 354 of GRU VOR and follow this radial to a fix where approach procedure begun. I drawn a magenta line showing this radial on a chart and in Google Earth. It touches P15 Prohibited Area – that is a refinery – an easily recognizable place in my photoscenery. Flight # 1. FSX default settings. Flight # 2. FSX with updated magnetic variation (freeware downloaded from aero.sors.fr) and default navaids. Flight # 3. FSX with updated magnetic variation and navaids (freeware downloaded from aero.sors.fr). aero.sors.fr gives a choice between 2010 and 2015 magnetic variation – I use current data. (there is no choice for navaids). I created a perfect testing weather – with no wind and no turbulence. Flying along the radial I reached the city of Gdańsk in flights 1 and 2. It was an error of aproximately 3.5nm. Flight no. 3 ended over Gdańsk refinery. Error was decreased to 0,8nm. Geographical (true) radial 354 of GRU should be flown at magnetic heading of 358°50″ (magnetic radial 354° + mag. variation 4°50″ E). You can get precise data on magnetic variation here: (http://www.ngdc.noaa.gov/geomag-web/#declination). I explained how to calculate true and magnetic heading in my previous text – Magnetic Vatiation. In flight no. 1 and 2 the true radial was 355°. In my third flight it was – 358°. On each picture I wrote what my instruments showed – true heading (taken from the GPS) and magnetic heading (from compass). Magnetic radial is always 354 – as in the procedure. I deliberately chose to fly north during my test to avoid heading changes that happen when following eastern or western radials. If you do not know what am I writing about in this paragraph – skip it – I will explain great circle navigation in one of my next articles. I checked that 10 years ago magnetic variation for Gdańsk was around 4° E. Currently it is 5° E. As you can see – in the first flight the difference between the magnetic and true heading is 4 degrees. In the second flight the difference is 5 degrees (remember – I updated the magnetic variation in FSX for the second flight). It’s the same in the third flight (mag. var. was also updated for this test). The first error was in the compass readings. In the first two tests I flew true heading 355 but outdated magnetic variation in FSX caused 1 degree error in compass readings. aero.sors.fr MagVar update solved this problem but in flight #2 I was still flying in the wrong direction. That was caused by the outdated navaid calibration data. In FSX (just like in the real world) each VOR is calibrated for magnetic variation so that the radials that you select when setting HSI are magnetic, not geographical. In case of GRU VOR in FSX it is calibrated for 1° E magnetic variation. That is what sent me in a wrong direction. The problem is that the current magnetic variation for GRU is 4°50″ – almost 4 degrees bigger than the FSX’s. That is why you need to update your navaids. On the last test I noticed the angular error of 50 arc minutes. aero.sors.fr probably uses 2010 data for navaids and 2010 magnetic variation for GRU was 4°25″. As the FSX only allows for an integer in magnetic calibration of navaids – it’s rounded to 4°. Magnetic variation affects navigation when a sim-pilot is using classic navigation techniques like dead reckoning and radio-navigation (vor-to-vor). Magnetic variation error in FSX may be as small as 1 degree in Western Europe and as large as 10-20 degrees in some parts of Northern Europe and northern parts of Canada. In case of navaids – FSX data is highly unreliable and adds another 1-5 degrees of error (or more in locations close to magnetic north and south). If you use VOR for enroute navigation – 5 degrees makes a 9 mile error 100nm from navaid. It is not something that would make navigation impossible but it is irritating. Especially if you try to find an airport that is 100nm from a closest navaid using VOR and DME only. The first updates magnetic deviation in FSX (your compass will show the correct magnetic heading). FSX & P3D Navaids Update updates navaids – calibration errors will be removed or significantly decreased. 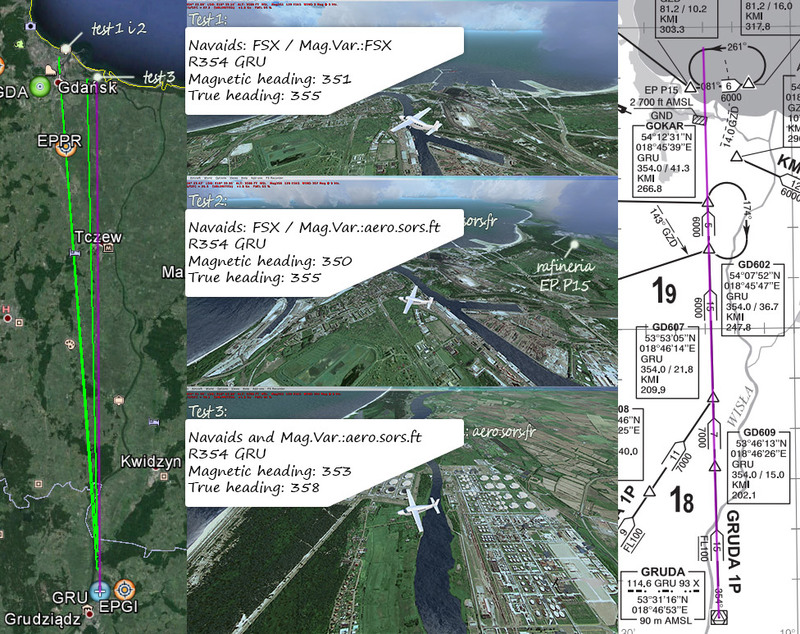 ILS magnetic calibration at some airports (in Europe) can be updated with FSX & P3D Navaids. ILS at other airports can be updated manually with a tool provided. I do not see a sense in updating ILSs unless you see a significant error. Add-on sceneries usually correct ILS magnetic variation and in a default airport a slight offset should not be a problem.